Tape Only. KONG has abducted a young maiden and has trapped her at the top of his lair. You have to climb the scaffolding and ladders to rescue her. 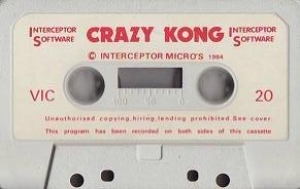 KONG is angry and rolls barrels down to crush you. Avoid being crushed by jumping over the barrels. If you get to the top, then in the second screen you can use the mallet to smash the barrels. Use of the mallet lasts about 15 seconds. Every barrel you smash gains you 200 points. In the third screen, you can use the lift. If you can time the jump accurately. KONG is now really furious and is throwing fireballs. The fireballs are deadly. 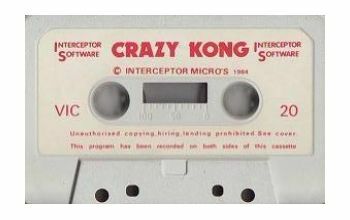 OPERATES ON THE UNEXPANDED VIC 20.